It is with great sadness that we learnt of the death of the Past President of the ISC, Dr. José Carlos d’Almeida Gonçalves. Dr. José Carlos d’Almeida Gonçalves was born on April 29th, 1929 in Portugal. Dr. Goncalves has created a technique, namely fractional cryosurgery, to treat skin tumors with diameters of 10 mm on and around the eyelids. The advantage of Dr. Goncalves’s technique is that the final scar is much smaller than the size of the original skin tumor, most being imperceptible. 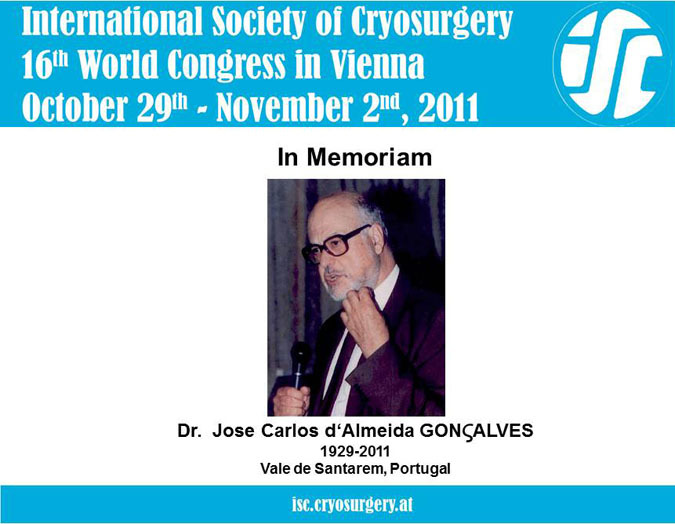 Dr. Goncalves was elected as the President of the ISC in Lisbon, Portugal at the 11th Congress of the International Society of Cryosurgery in 2001 and has administrated this function 2 years long till 2003. As well Dr. Goncalves has worked as Head of the Departments of Dermatology at the District Hospital of Santarem and Portuguese Institute of Oncology of Lisbon for several years. A few weeks ago, Dr. Gonçalves dead in Vale de Santarem, Portugal on September 4th, this year. We send our deepest condolences to his family and colleagues. Now we have a minute's silence in commemoration of Dr. Jose Carlos d’Almeida Gonçalves.